The below listed functional designs were previously completed by the Transportation Planning Department who also conducted required consultations. These functional designs will form the basis for refining the design moving forward. The intent is to implement these concepts as closely as possible to the approved functional designs. Design: $2.7 million (estimate) – includes functional design, geotechnical and environmental investigations, as well as this assignment, which will include preliminary and detailed design. A public information session is expected to be held in late spring 2019, to present the preliminary design drawings to the public. At this time, attendees will be able to review the design, ask questions and provide comment on the proposed works. An additional detailed design public information session is expected to take place late fall 2019 to show the final design that is to be implemented. Further public information sessions will be scheduled in advance of construction in order to present proposed traffic management and construction staging strategies to the public. 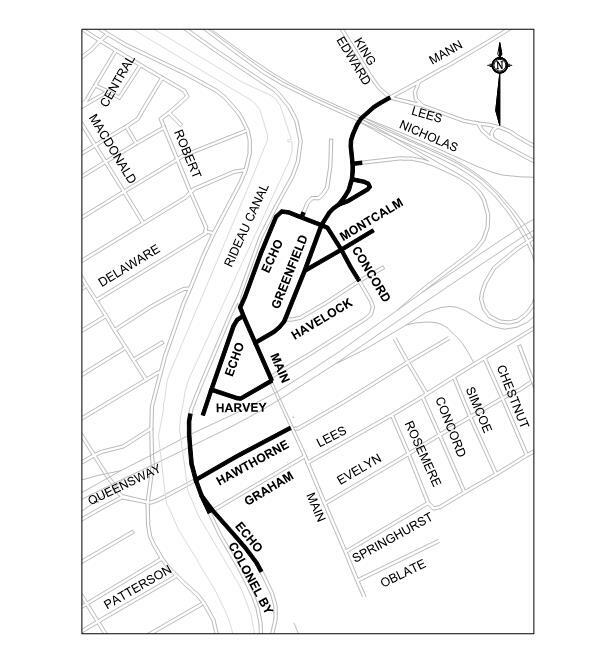 The City of Ottawa has commenced design work for the rehabilitation of the northern section of Old Ottawa East. The project area is predominantly bounded by the Rideau Canal to the west, King Edward Avenue to the north, Highway 417 to the east and Hawthorne Avenue to the south. A 160-metre section along Colonel By Drive/Echo Drive, which extends south of Hawthorne Avenue to Immaculata High School, is also included in the project limits. This work is being conducted to replace aging combined sewers with separate storm and sanitary sewers, replace sections of older watermains; and reconstruct the roadways, including the implementation of complete street features for the betterment of all road users in your community. Who: Novatech has been retained by the City of Ottawa to develop preliminary and detailed designs for a construction contract that is currently scheduled to begin construction in 2020. Why: The majority of the subject streets are serviced by combined sewers capturing both sanitary and storm drainage. With this project, these combined sewers will be replaced with separate sanitary and storm sewers, thereby reducing the risk of both combined sewer overflows and the potential for flooding during large storm events. With the replacement of the sewers, sections of watermain that have reached their service life (some in excess of 100 years old) will be replaced to maintain the level of service required for your community. Due to the impact of the proposed sewer and watermain works, the subject street segments will undergo full road reconstruction. This will provide the City the opportunity to implement enhancements for all road users (e.g. pedestrians, cyclists, transit and motorists). What: Work will involve the design of storm sewers, sanitary sewers, watermains, roadways, sidewalks, cycling infrastructure, traffic signals, street lighting, and streetscape/landscape treatments within the City’s right-of-ways. The design will detail the replacement of water services and sewer laterals from the new mains to the property line at buildings within the limits of the reconstruction. Modifications to pavement and sidewalk widths, including the addition of cycling lanes and raised cycle tracks will be included as part of the design process. It is anticipated that confirmatory field investigations may be required at some properties to determine building drainage and service connection details, along with survey works to confirm appropriate grading tie-in points. Where required, these property owners will be contacted directly. A summary of the anticipated project timeline and exact street segments is provided below. When: Design work has already commenced and will include environmental and geotechnical investigations, supplementary survey work and other field investigations, many of which will be taking place this fall. The design is expected to be completed by early spring of 2020. Construction is currently expected to begin in May of 2020 and run through the fall of 2022. Typically, construction will occur between spring through to late fall, with a winter shut down period. This schedule will be confirmed through the detailed design process. The Greenfield Avenue, Main Street, Hawthorne Avenue et al. reconstruction project is considered a Schedule A+ project under the Municipal Class Environmental Assessment, October 2000 (as amended in 2007, 2011 and 2015), published by the Municipal Engineers Association. Schedule A+ projects are pre-approved; however, the public may direct comments to City Staff during the course of the design process.